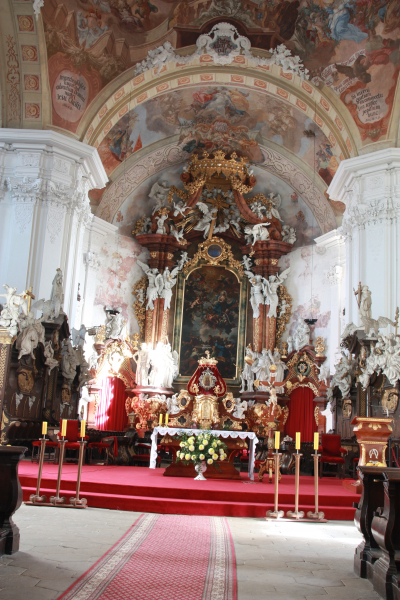 The instrument was built in 1732-1737 by Michael Engler. 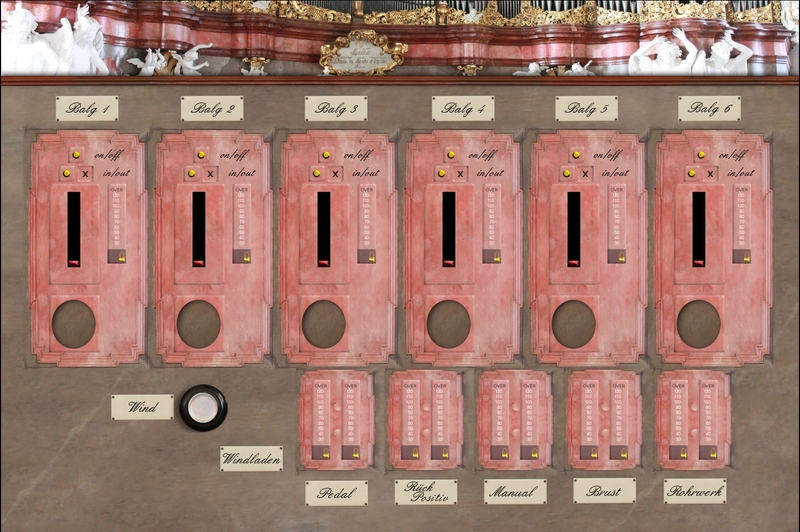 A representative instrument of the Silesian organbuilding has 3 manuals and a pedal, alltogether 50 stops. The Positiv occupies the lowest manual and is positioned in two small cases in the balustrade. One case is dedicated for the C part of the windchest the other for the D part. 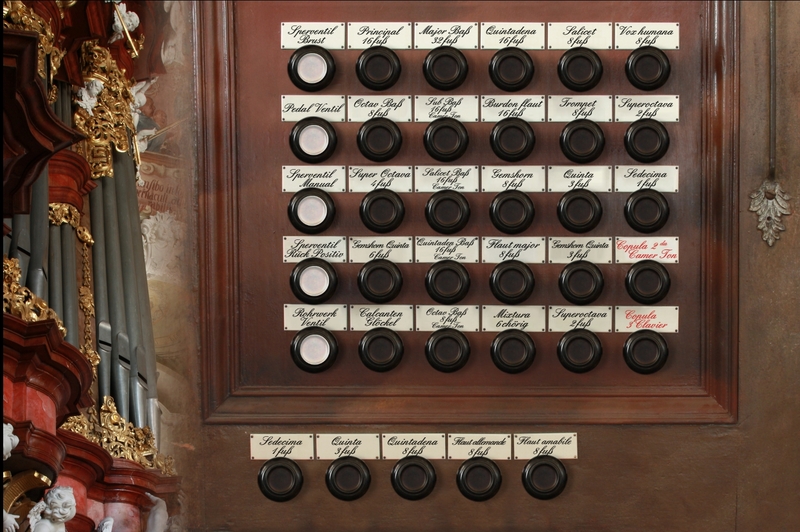 Hauptwerk (2nd manual) and Oberwerk (3rd manual) and the Pedal are located in the main case which spans wide through the full width of the church nave. 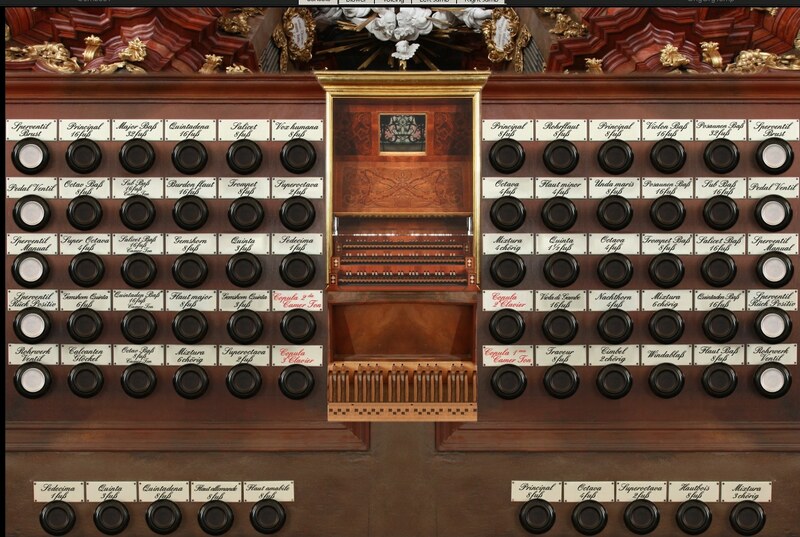 The Oberwerk occupies the center of the case, Hauptwerk is divided into the C and D side to the left and to the right of the Oberwerk, and the Pedal is located in the two side towers and at the back of the organ case. 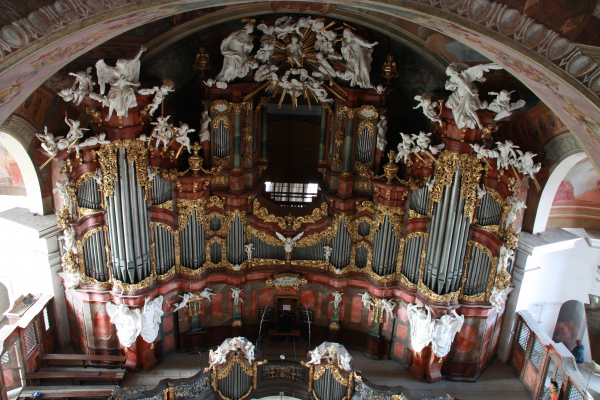 All the three divisions are perhaps surprisingly situated on the same horizontal level, although this design is rather common in the Silesian (and Central-Germany) organ building of the period. The "Werk-Prinzip" was not abandoned, but restructured. Perhaps, the general idea of this design was to achieve more homogeneous sound. 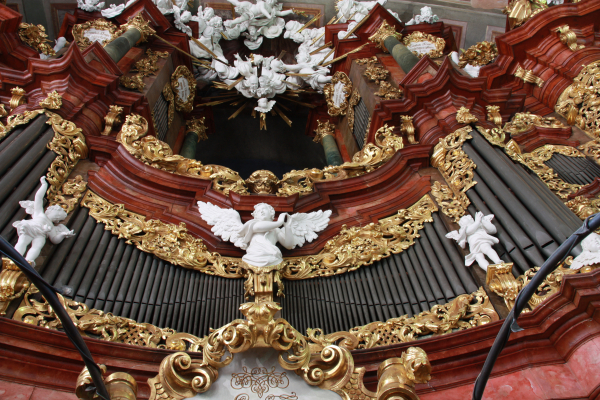 The instrument bears the typical characteristics of the Silesian organs. Rich in fonds, well supplied with aliquot stops, crowned by the mixtures with a tierce ranks. There are two undulatings stops on the manuals (Vox humana and Unda maris). The reeds are few in number in manuals, but they give a robust fundament to the Pedal, starting with Posaune 32'. 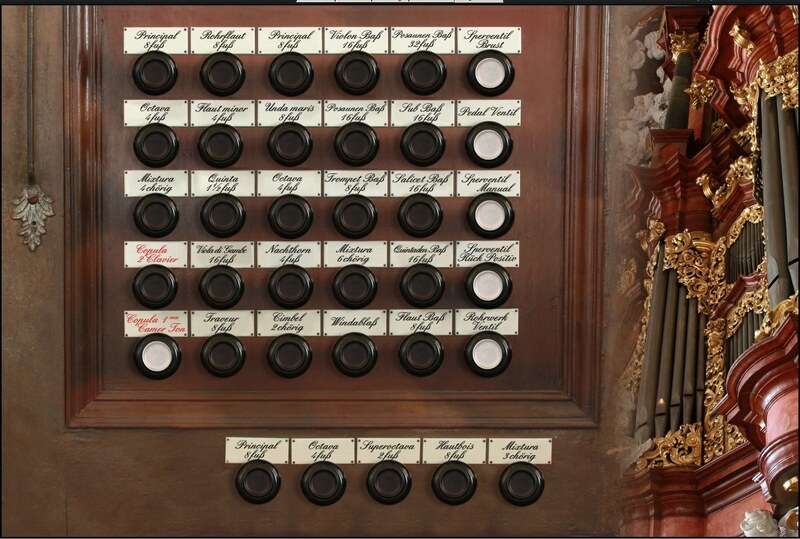 The sonority of the full chorus of the instrument is determined by the 16' fundament of the Hauptwerk (there are three 16' stops on HW) on one side and by the 8 (or 12 if coupled) ranks of mixtures on the other side of the sound spectrum. The voicing is round and mild. The manual reeds are specific in color. The Trumpet is soft, almost Oboe-like, while the Positiv reed has the timbre similar to a somewhat thicker Regal. The extensive use of strings (Gamba, Salicional, Traveur) is also a mark of the Eastern organbuilding tradition. 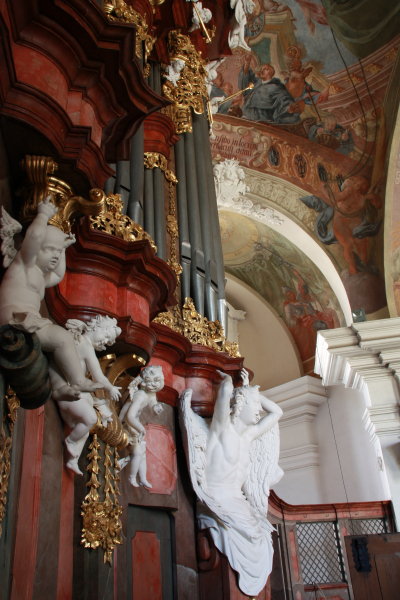 One technical peculiarity is preserved in Krzeszow: the keyboard of the Positiv is movable, allowing a transposition down a whole tone, thus allowing the Positiv to be used in Kammerton with other "chamber" instruments of the period. In addition to the Positiv transposition, there are also 4 Pedal stops which may sound in Kammerton. In 1873-1874 the instrument was partially rebuilt by Schlag, the modifications affected mostly the console (introduction of the Barker machine etc.) but fortunately only few stops were removed or altered in voicing. The Positiv lost its aliquotes, Hauptwerk was given two more reed stops on a new windchest, several stops in Pedal were adjusted. 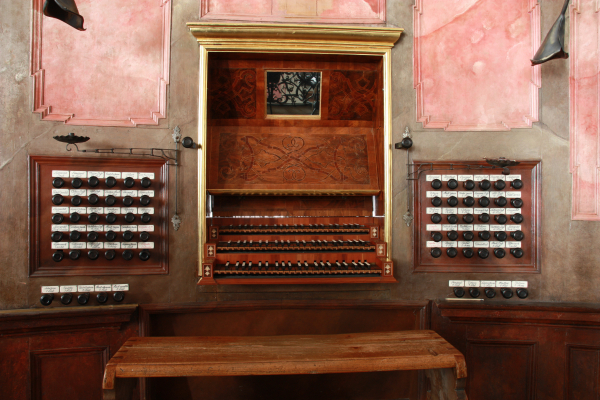 In 2005, the restauration comittee decided to go back to the original Michael Engler state of the instrument. 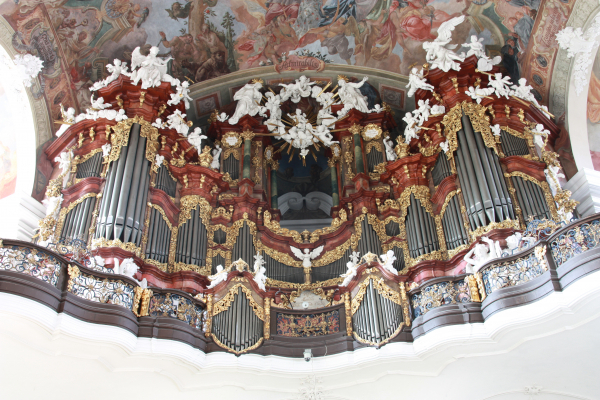 The restauration work has been done by the organbuilders Jehmlich from Dresden in 2006-2008. 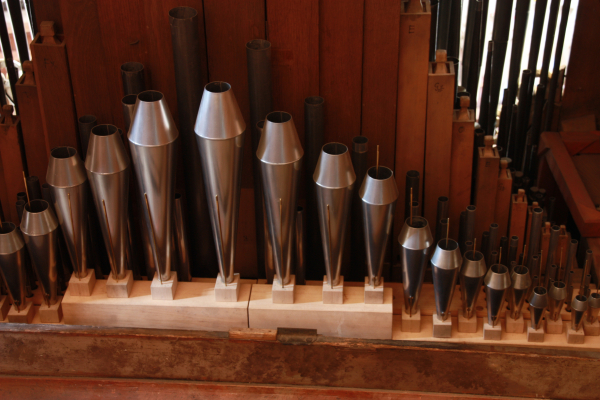 As the result, the instrument has now the identical composition as when finished by Michael Engler in the 18th century. The value of the instrument is underlined by the fact that it is probably the best preserved Michael Engler's instrument, practically the only one surviving up to the present substantially unaltered. 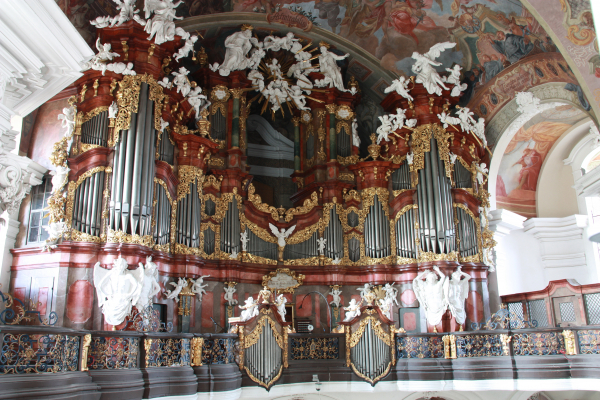 The other extant big instrument of the organbuilder, the St. Moritz organ in Olomouc (built 1745), was subject to extensive modifications in the course of 20th century. The samples are offered in 24bit/48kHz quality; multiple releases (3 levels) and occasional multiple attack samples are used. Hauptwerk v.4 and higher supported. The reverberation time is about 5-6 seconds. The sample set is presented in the surround version. 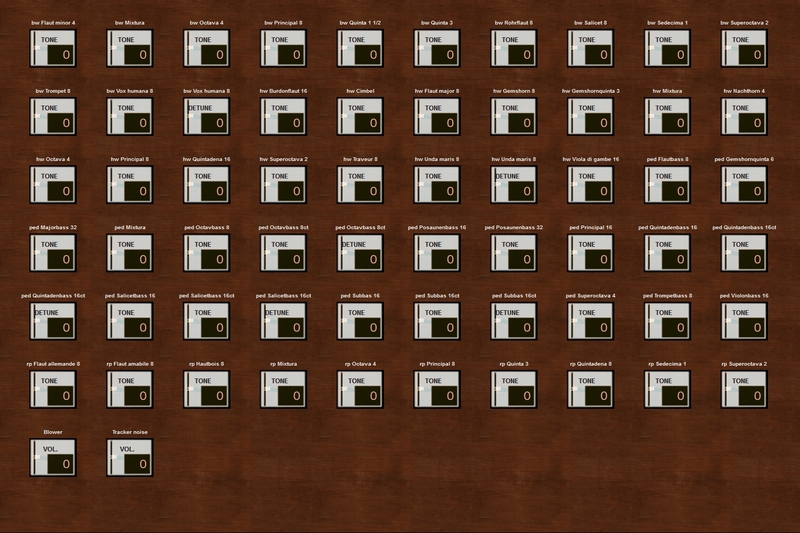 The surround version can be used for emulating the wet sample set as well (by muting the rear ranks). The organ is presented with extended compass, the low C# added. 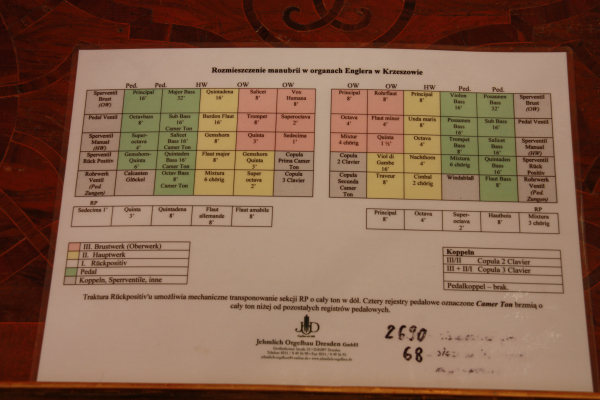 The temperament is meantone modified and there is special Krzeszow Temperament Chart available with the sample set. Ventils for all the divisions. A transposition coupler for Positif available (Kammerton). The core installation package 870, ver. 1.01. The fix corrects the following issue: The Copula 1ma Camer Ton on the Console Tab doesn't synchronize with the same named stop on the Right Jamb Tab.When reset, the one on the Right Jamb page is on, while the one on the Console page is off. When switching the one on the Right Jamb page off, the one on the Console page goes on. Simple stop jamb screen would be useful for Krzeszow sample set. Pedal, Trompet Bass 8', tones 60-C, 64-E and 65-F have some instability in speech. No update needed. The organ information html, the stop list uses alternative names for some stops. No update needed.